Recently in British Columbia, much is being said about the need for personalization. The Ministry of Education's new BC Education Plan emphasizes the importance of personalized learning. We must not confuse personalization with individualization and differentiation. "Personalized learning is not individualized learning, in which students share the same learning goals but progress through the curriculum at their own pace. Nor is it differentiated instruction, in which students also share learning goals but receive instruction that is tailored to their learning needs. Personalized learning is an instructional approach that encompasses both differentiation and individualization, but is also flexible in content or theme to match the specific interests and prior experiences of learners." But what does personalized learning actually look like? feel like? 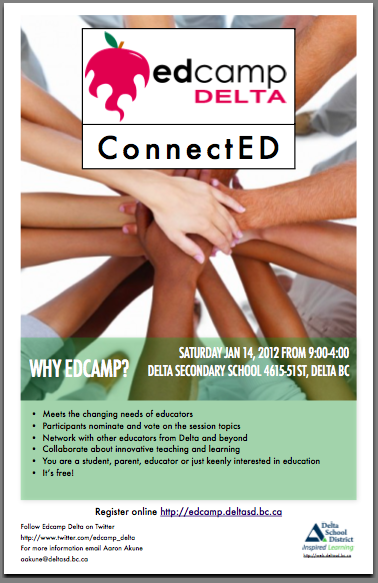 Well, on Saturday January 14th I participated in a personalized learning experience at Edcamp Delta. For those of you less familiar with how an edcamp works, let me briefly explain. There is no keynote speaker and no set topics. Participants propose discussion topics leading up to and in person on the morning of the event. Participants vote for topics that interest them and based on the popularity of the respective topics, the organizers arrange the discussion topics within a grid and create a schedule for the day. Participants choose to participate in sessions they are most interested in. One or more participants step forward to initiate the conversations in each session. Participants share ideas, perspectives and experiences with each other. They respond to each other's questions and queries. So, what key features of an edcamp contribute to such a personalized (not just individualized or differentiated) learning experience? Participants arrive with different goals for the day. Some wish to network, others want to share ideas about specific topics and some want to ask questions. The content is flexible and participants choose discussion topics based on their specific interests and prior experiences. Each participant contributes and adds value to the other participants' learning. Face-to-face and backchannel conversations take place within each session but participants may choose to extend their conversations throughout the day. There is an absence of hierarchy. There is no 'teacher', no 'expert' and no passive attendees trying to soak up information being delivered by the 'guru' in the room. All participants are learners, helping one another. What transpires from this is truly remarkable. 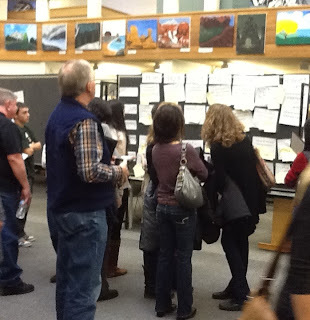 Each participant is deeply engaged and exudes a passion for learning. Being surrounded by such energy and enthusiasm is both motivating and inspirational. And one is guaranteed to walk away from an edcamp event curious about a new topic and wanting to continue a conversation started earlier in the day. So, in British Columbia as we look to reshape education in a way that supports personalized learning, maybe we should be considering the success of recent Edcamps and borrow key aspects from the 'unconference' model of learning. Imagine how the notion of school might change if learners had the choice to investigate self-directed inquiry topics based on their curiosity and interests? Imagine if learners shared questions and problems with their local and global network and challenged each other to think critically and be creative problem-solvers. Imagine if learning was made more social, with more emphasis on learning together, where learners communicated, cooperated and collaborated in an effort to build shared knowledge and understanding? Undoubtedly, this would lead to more questions about our current model of 'schooling'. Organizationally, how might this look in a class? in a school? How might this impact curriculum? Would this lead curriculum to emphasize skills more than knowledge? How would this alter the traditional role of the 'teacher' and 'student'? I recognize these are not easy questions to answer, but neither is the challenge of envisioning a personalized learning system for all students in BC! I have not yet had the oppurtunity to attend an edcamp, but the more I hear about them the more I feel the need to participate. I am developing a new program for the Chilliwack School District called Program Empower. I will be working with the 10 most at-risk kids in our alternate highschool and handing them an Evergreen diploma based on personal learning and empowerment. This is the first time this has been done in my district, and although it is was my idea, I am feeling overwhelmed with grasping my approach. Start date is Jan.30. This blog tweaked my perspective and I now visualize my first week running more as an edcamp in the classroom. My problem is that these kids do not have an overabundance of appropriate insight. Non-Readers, learning disabled, numerous disorders, homeless, no computer skills, completely innappropriate...now the question becomes: How do I create and direct an edcamp that provides enough guidance to actually inspire and enable a successful and meaningful experience? Hi Stacey, it sounds like you have quite a challenge in front of you. 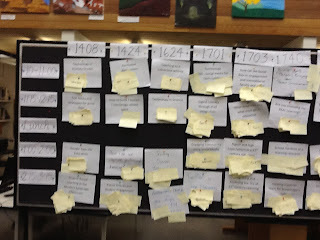 There is a lot of information about how to run an Edcamp at http://edcamp.wikispaces.com/. That said, I'm not sure it would be easy to incorporate an unconference format with a 10 person class. I do think that elements of an edcamp could be very valuable in an alternate classroom like yours. Depending how comfortable your students are with each other, it might be helpful to emphasize the social side of things first. As students become increasingly more comfortable relating to each other, trust will be established and the learning will become deeper. At Delta Secondary, we have a 'Work Options' Alternate Program that leads to an Evergreen as well. The teacher (Karen - @kgadowsky)) utilizes a project-based approach much of the time, where the class starts a class business. Within this approach, students learn everyday mathematics, letter writing, basic tech skills and more than anything are charged with the responsibility of the details required to operate a business. The skills emphasized are practical skills that serve the students well as they head into life pursuing jobs in the 'real' world. Yes comfort is definitely key. Thanks for the info and Karens tweet, I will add her.